Motorhome Forums, Motorhome Discussion, Motorhome Chat > Mechanical & Technical > Electrical > Lowest volts? What is the least voltage you'd say it's advisable to let your leisure battery drop to? I know it harms them to let them drop too low but how low is too low? At rest I would guess at 12v would be my minimum. Below 11v will start to harm the battery. imho. Penquin and Matchlock like this. Sorry Ray, what do you mean by 'at rest'? Do you mean with no drain on it? 12v as a minimum before you need to start charging which is pretty much 50% capacity. I tend to never let mine get below 12.1. If it gets to 9v its bad news for you battery. fdhadi, chilly, Penquin and 1 others like this. As Barry's chart shows chilly, more details than I could explain. But yes when I said at rest and with no load. Obviously when using some heavy loads the volts will drop even further but with no load again should recover to at least 12v. It will also depend on what type and model battery your van is fitted with. For instance the very popular Varta 90 VRLA battery is 50% discharged at 12.5v (off charge and off load) and that’s as far as it’s recommended to drop. 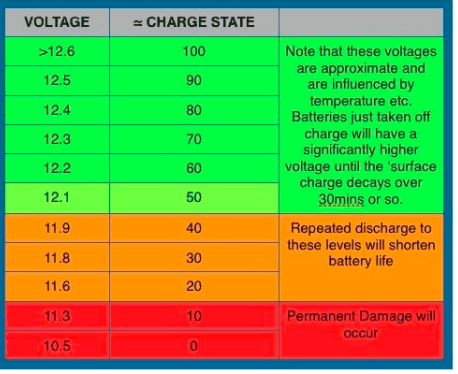 Conventional batteries are normally 12.1v - 12.2v as Barry’s chart shows. Last edited by ob1; 15-04-2019 at 21:15. So it’s discharged if it drops just 0.1 volts?? Only yesterday I was thinking about trying to find the very chart that Barry has just posted as the last one I had went with the MH when I sold it. Spooky or what? I will never allow ours to drop below 12.5v as like others I am concerned that some damage may be initiated. I believe that if you have "cheap" batteries they are more susceptible to damage at lower voltage as the surface of the plates is less stable. 12.5 is quite a high limit to set yourself Dave. Should be ok well below that. I find that ours can be full charged then after a heavy day or evening of usage it can be down to 12.3, 12.2 or even 12.1 by midnight. It's back up to full by lunchtime though in summer on the solar. Never seems to do any harm and I don't half batter mine.